Colombia’s demobilized FARC have finally revealed their official list of assets — worth hundreds of millions of dollars — but the country’s top prosecutor has already lambasted the “useless” inventory, which likely comes up far short in its accounting of the former guerrillas’ true riches. The now-demobilized Revolutionary Armed Forces of Colombia guerrilla organization has declared a wealth of approximately $332 million, including items such as real estate, cattle, gold and even household appliances. After the FARC published a summary of its assets, Semana magazine posted online an apparently leaked version of the full inventory. The FARC had delivered the inventory to the government with the aim of converting the assets into funds for Colombia’s victims, following the official disarmament of the rebel group earlier this month. However, the inventory sparked outrage for its apparent lack of diligence, as well as for listing basic everyday items with little cash value, such as broomsticks, orange squeezers, mugs and talcum powder. [The full list reveals that alongside the household items that received much ridicule, the FARC listed expensive appliances including dentistry equipment and industrial tools.] It prompted Colombia’s Attorney General Néstor Humberto Martínez to write a letter of disdain to the government. Much of the real estate listed by the FARC, which amounts to around half of all its assets, lacks any official registration, “which frankly makes it useless and inadmissible” to the inventory, Martínez wrote. As the ownership of these properties cannot be legally identified, the Attorney General’s Office has stated that “for now, none of the FARC’s real estate is immune to being seized” by authorities. In the inventory, the FARC also “accepted as [their] own” any assets that state prosecutors may have uncovered in their investigations into the rebel group, without actually identifying these themselves. Authorities have already started seizing FARC assets worth nearly $580 million dollars, according to Martínez’s letter. In addition, the list includes items and services that cannot be liquidated, and which were rejected by Attorney General Martínez. This includes medical services the guerrillas offered such as first aid and surgery; their weaponry, all of which will either be destroyed or turned into commemorative monuments; and thousands of kilometers of roads the FARC supposedly built. A FARC leadership press release from Aug. 25 offered a rebuttal to Martínez’s critique, blaming the ambiguous property ownership on the state’s historic absence in rural areas, and claiming that the rebel group had lost too much information during the armed conflict to offer a truly exhaustive list of assets. The group’s accompanying letter to the United Nations, which received the first version of the inventory, highlighted the time restraint it was under, and offered to provide all details necessary to locate properties in the longer term. Is all the money there? Although the rebels have long stood by their claim that “the FARC have no money,” over 50 years of lucrative criminal activities and proof of extensive money laundering strongly suggests that their wealth is far greater than they have admitted. According to InSight Crime calculations for 2015-2016, before the FARC officially disarmed, the guerrillas’ potential yearly earnings from illegal activities may well have reached $580 million, mostly from the drug trade and illegal mining. And estimates published by The Economist in 2016 suggested that the FARC’s total assets could surpass $11 billion. 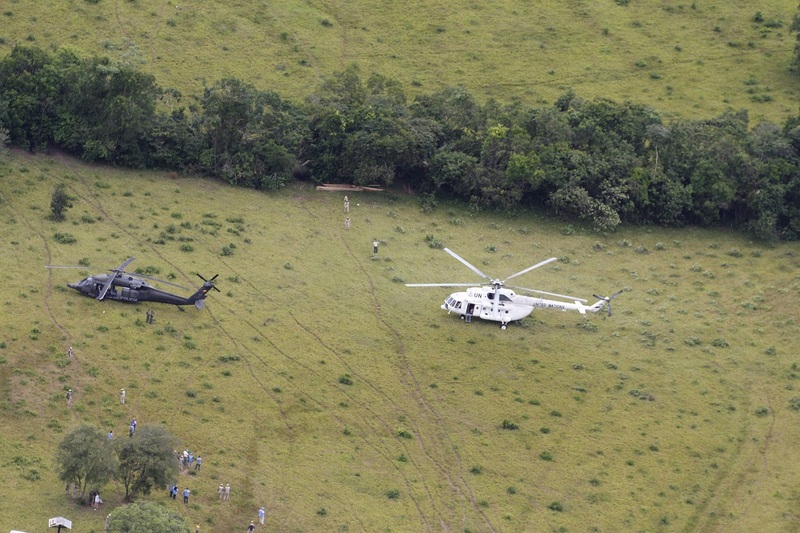 There is evidence that much of the FARC’s wealth remains under wraps. 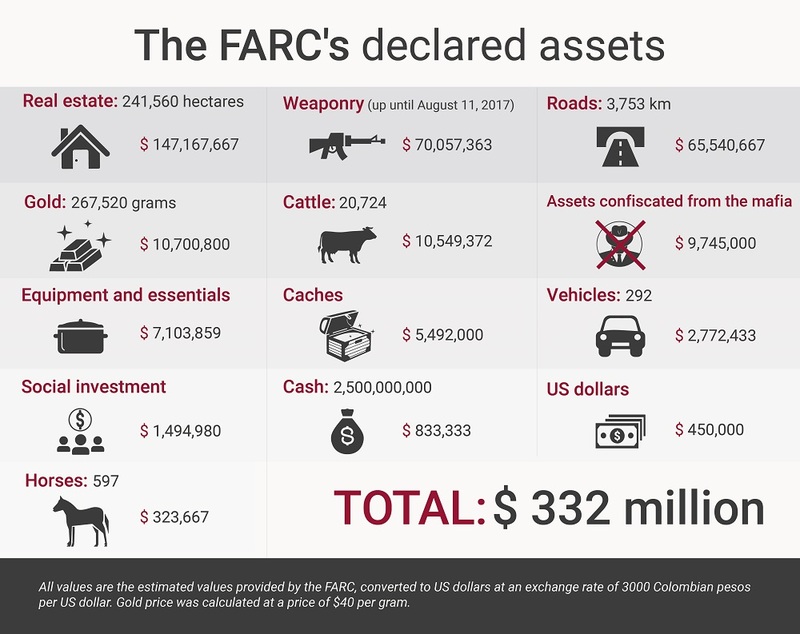 Firstly, Colombian authorities have already identified or seized FARC-linked assets worth much more than what the FARC has declared, such as urban properties and cattle that in themselves exceed those listed in inventory. And while the FARC claim that much of their earnings goes towards combat funding, including weapons, the modernity and high quality of the firearms they handed in to the U.N. betrayed their significant wealth, according to a high-ranking UN official cited by Semana. However, while many fronts certainly profited from lucrative criminal activities, it is most likely that many mid-level commanders never declared this wealth nor pushed it up to the FARC leadership, preferring to line their own pockets. This is one of the reasons why the FARC’s official inventory is probably slimmer than its true wealth — much of it has not been brought to the knowledge of the top brass, or remains in the hands of commanders that deserted the peace process. Indeed, the front-by-front breakdown of guerrilla assets revealed that tens of millions of dollars in assets appear to have been sequestered by powerful dissident groups in east Colombia. Perhaps most importantly, much if not most of the former rebels’ money is being laundered by an unknown number of frontmen — legal citizens that may not have an apparent affiliation to the FARC — which could help the group keep assets undetected. Furthermore, Attorney General’s Office sources have told InSight Crime that most of the organization’s wealth is stashed in overseas assets. The inventory apparently does not include foreign assets or bank accounts. Ultimately, it is likely that FARC members of all levels have kept clandestine assets as a safety net moving forward, as a means of funding their political movement or to keep a foothold in certain criminal economies. The FARC’s ploy to include any assets uncovered by prosecutors within their inventory, without having to identify them, is unlikely to work. However, it does suggest that the FARC are in trouble and, if obligated, might fail to match the attorney general’s verified list of assets. This is one of the easiest ways for authorities to strip the former guerrillas of the benefits of transitional justice, including maximum sentences of eight years for the most serious conflict-related crimes. Prosecuting former rebels as common criminals may give satisfaction to those opposed to the peace process; some believe the attorney general is among them. But it could also be one step too far for many of the former guerrillas who have little faith in the process, and who could quite easily return to their past lifestyle, and earnings, if the threat of prison time looms. Nonetheless, some fears surrounding how FARC assets would be spent were dispelled in an Aug. 24 presidential decree, which affirmed that all proceeds will go exclusively to Colombia’s victims. This should remove the possibility of proceeds being used to fund FARC reintegration programs or political activity, which would have given the former guerrillas some control in administering their own funds, and was seen as a chance for them to launder their dirty money. In addition, the attorney general’s suggestion that all of the FARC’s real estate still risks being seized raises the question of whether these proceeds will ever reach Colombia’s victims. Any seized assets would technically pass through the ordinary justice system, rather than the transitional justice system, though some government officials have suggested they could still go to victim reparation.